Than, raised in Burma (Myanmar) on a farm, attended a village school to Grade 5. With fighting close by, it became very dangerous to go to school, and he was needed to care for his widowed mother. The Burmese military (fighting against ethnic groups) burned the village many times – the Karen villagers would run to hide, then come back. However, in 1995, when Than was 17, all the rice storage was burned. With no available food, all the villagers and farmers in the surrounding area fled to Thailand. The group of 200 (including his family of 6), spent 3 days and nights climbing mountains, crossing rivers, avoiding landmines and the army. Sleeping on the trail for a few hours, they could not take off their backpacks to rest, for fear of being caught. Thousands of the Karen people fled. At the Thai-Burma border camp, given some rice, yellow beans, salt and fish paste, 2 pots, and a plate for each family member, refugees were required to build their own bamboo huts directly on the ground. Bamboo was cut in the forest, the roof was covered with leaves. The cooking area was a corner of the hut, using 3 stones to support the pot. With no clean water or toilet facilities, they dug a shallow well hole beside a small stream. However, the rains came and the runoff polluted the ‘well’. With very little and unfamiliar food, always being wet, and unclean water, many became sick. From the forest, they foraged leaves and bamboo shoots to eat. People were not allowed to leave the small space allotted for the camp, but when it grew to over 1000 people, they were forced to move and start rebuilding again (this occurred 3 times). The jungle took over the deserted camps. In the 3rd camp, Than married and became the father of 2 children. His wife had been a refugee since she was 7. In this camp, a midwife, a walk-in clinic and organizations in charge of education and food distribution were present. In 2015, after 20 years in refugee camps, Than and his family came to Canada. They had rarely seen any modern conveniences so the trip was overwhelming. In the Bangkok airport, they were instructed to hold onto bags with signs indicating who they were. No one spoke the language, so the family was terrified! 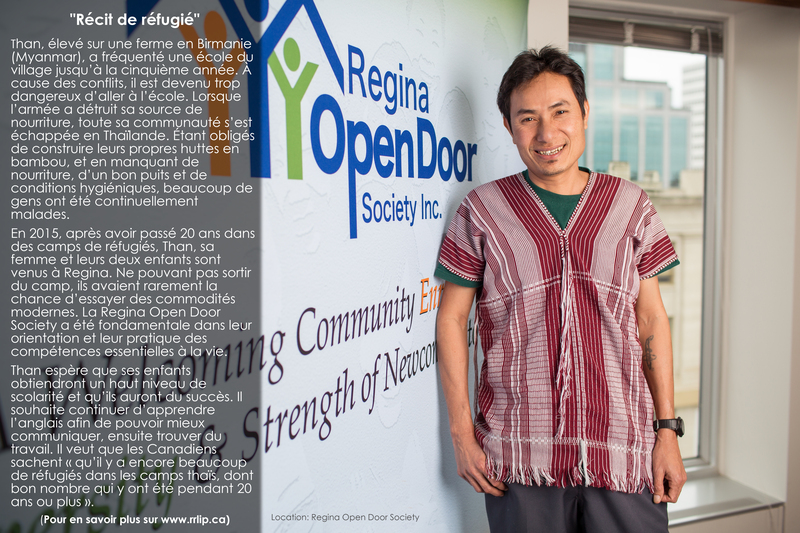 In contrast, arriving in Regina they were met by RODS staff, an interpreter, and his brother, another recent immigrant. They were so relieved! A huge immediate challenge confronted them - how to use modern conveniences, like the shower, toilet, stove, microwave, etc. Life Skills orientation provided by RODS was absolutely crucial and though scared, with practice they learned, little by little. The family is also so thankful for the Karen community in Regina, as well as another family member who resides in the city. It is so helpful to know others who speak their language. Than, élevé sur une ferme en Birmanie (Myanmar), a fréquenté une école du village jusqu’à la cinquième année. À cause des conflits, il est devenu trop dangereux d’aller à l’école. Lorsque l’armée a détruit sa source de nourriture, toute sa communauté s’est échappée en Thaïlande. Étant obligés de construire leurs propres huttes en bambou, et en manquant de nourriture, d’un bon puits et de conditions hygiéniques, beaucoup de gens ont été continuellement malades. En 2015, après avoir passé 20 ans dans des camps de réfugiés, Than, sa femme et leurs deux enfants sont venus à Regina. Ne pouvant pas sortir du camp, ils avaient rarement la chance d’essayer des commodités modernes. La Regina Open Door Society a été fondamentale dans leur orientation et leur pratique des compétences essentielles à la vie. Than espère que ses enfants obtiendront un haut niveau de scolarité et qu’ils auront du succès. Il souhaite continuer d’apprendre l’anglais afin de pouvoir mieux communiquer, ensuite trouver du travail. Il veut que les Canadiens sachent « qu’il y a encore beaucoup de réfugiés dans les camps thaïs, dont bon nombre qui y ont été pendant 20 ans ou plus ».